The 2015 Panini Super Bowl XLIX Private Signings football cards are exclusives released in conjunction with a special promotion on Panini's online shop. Available for a limited time leading up to the big game between the New England Patriots and Seattle Seahawks. 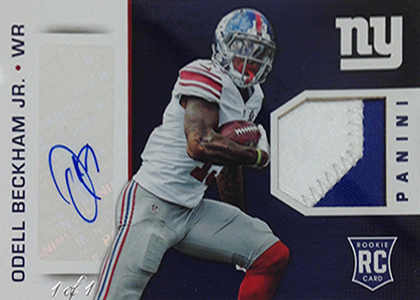 For each purchase of select 2014 Panini football products through their story collectors received a one-card pack with one of the special autograph cards. They're available in three types. Private Signings come with autographs from current and retired players. Highlights include Brett Favre, Joe Namath, John Elway and Emmitt Smith. Super Bowl XLIX participants Russell Wilson, Marshawn Lynch and Rob Gronkowski are also present. Private Signings Rookies take a similar approach with 19 first-year standouts from 2014. Rookie Signature Materials are also randomly inserted. These come with an autograph and a swatch of player-worn memorabilia. All 2015 Panini Super Bowl XLIX Private Signings cards, including the rookie autographed memorabilia cards, have one-of-one Foil parallels. 53 cards. Known print runs are noted. 19 cards. Known print runs are noted. 2014 Panini Hot Rookies Factory Sealed Football Hobby Box Jimmy Garoppolo AUTO?